One of more than a dozen species of breeding hummingbirds within the continental United States, Black-chins are found from southern British Columbia throughout most of the Western United States and Mexico. Mexico is their favorite winter vacation spots. Black-chins are small, weighing in about 3-3.5 grams. They are slender with a long fairly straight black bill, dull metallic bronze-green feathers on their back. The flanks are glossed with dull metallic green. Only the adult male has elegant purple band on lower throat, that appears black most of the time, but when the light hits the iridescent feathers, they sparkle like precious sapphires… Female is larger than male, chin and throat off-white and often spotted, the breast and belly dull white, dark tail feathers with white tips on the three outer feathers on each side. Juveniles are similar to adult female. 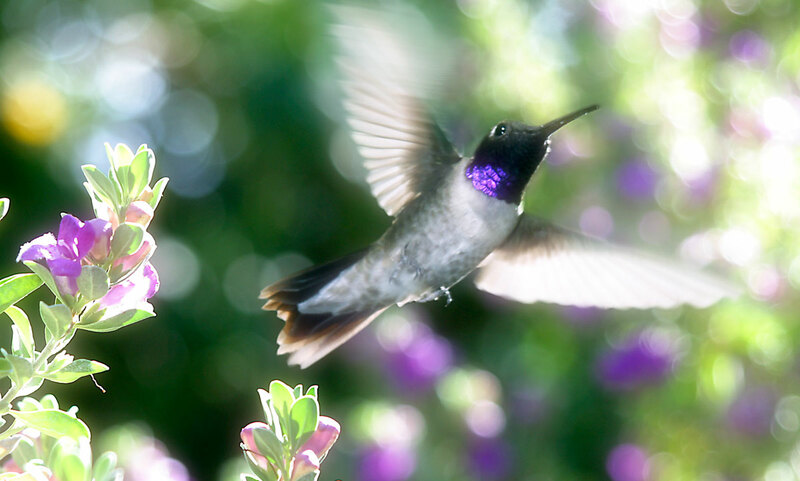 Hanging a feeder with 1:4 ratio of sugar and water, as well as planting nectar rich flowers in a garden helps attracting hummingbirds. In our backyard, lavender and salvia (sage) are their favorites.